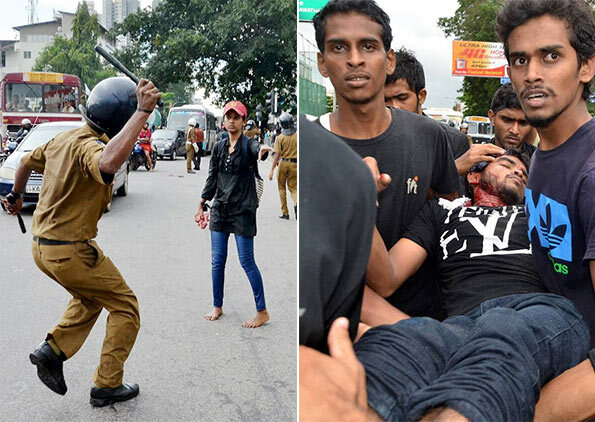 The National Police Commission has launched an inquiry into the assault on Higher National Diploma in Accountancy (HNDA) students by riot police this Thursday (29), said its Secretary N. Ariyadasa Cooray. The assault left at least 70 students with minor injuries, while 10 with severe wounds were admitted to the National Hospital. Over 500 students marched from Colombo Fort to the Ministry of Higher Education at Ward Place demanding authorities to re-recognize their course as equivalent to the BCom Degree offered by State-run universities in the country. “This incident reminds us of the refractory past when peaceful meetings, freedom of expression and protests to gain rights were brutally suppressed. It also creates a negative picture of the country as a State which neglects global human rights standards,” the FMM stated, demanding an impartial investigation into this attack from President Maithripala Sirisena and Prime Minister Ranil Wickremesinghe. Amnesty International, HRW, American Embassy in Colombo… where are you hiding? Where is your regular statements of condemning the brutal suppression of peaceful protests by the government ? Is this silence because now it is American sponsored suppression in Sri Lanka just like what happened in Singapore during Lee Quan Yu’s time? It appears the Chandrika-Ranil-Sirisena Government is similar in behaviour to the previous regimes in Colombo since 1948. Suppressing peaceful expression of dissatisfaction in Southern Sri Lanka is the hallmark of all Colombo based governments. I am sad to say the social and security situations in the north and east has rapidly deteriorated since Jan 08. With the new political status of Col Karuna (the darling of all sinhala leaders), residents of the east are bracing to a new wave of sponsored and protected terror in that corner of our land. its the president and government that changed not the stooges of the former government, these stooges are still holding top post even in the police force, and these so called stooges are behind these kind of incidences trying to gain popularity by ordering things like this to happen to show the world that the former regime was better than the present one a investigation should be carried out and strict punishment handed to any one irrespective of position they hold.